When the Hintonaires signed on, we knew it would be a special event. 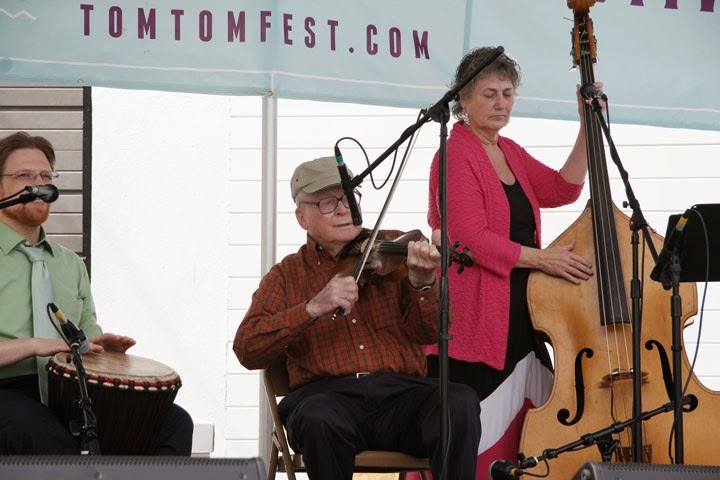 The Tom Tom Festival / Belmont Bash was a unique celebration in many ways. It had an unusual origin and interesting results. For me, the whole thing was an experiment in a few ways: how would one plan a multi-source celebration, what would a 100% DIY street festival look like and how such a party could inform public planning? It was amazing thanks to many people’s hard work. This three-part story examines how event came about, how it went and what I got out of it from a community-development perspective. Today we tackle the origins. The Belmont Bash has been around for a long time but never like this. It has appeared sporadically every few years in Belmont Park, depending on how organized the neighborhood association happened to be in any given year. It’s usually a blanket-in-the-park family picnic in the fall. Two years ago, it was really organized; last year it didn’t happen at all. Ever since the City undertook some minor street improvements in Downtown Belmont (about two years ago) there has been simmering talk of having the Belmont Bash in the streets to celebrate the change and initiate real public ownership of the small parklet that was created. But it never got past the “wouldn’t it be cool” phase. Separately, last year’s Tom Tom Founders Festival included a small block party at the nearby Bridge PAI. I participated with a photo booth and it was fun but there was no real hook—it was a nice little party on a weekend already oversaturated with Tom Tom events. That sort of conversation happens all the time in a community like this one but they don’t usually bear viable fruit. I’m interested to know why this idea worked while most others usually fail. The Belmont Bash would not normally leave the Park because it didn’t have the weight needed to maintain momentum through the many predictable reasons not to do it—principal among them being that its a lot of work. The Bash was lovely as it was but the community genuinely wanted a celebration in heart of the neighborhood. (Editor's Note: It would turn out that the neighborhood loved both the old and the new and is leaning toward having two annual events in the future). We needed an institutional backer and Tom Tom fit the bill and they really delivered. I’ll speak mostly about the community, but it’s very clear that none of it would have happened without Paul and his team. The neighborhood association had a small grant available (which had to be used by the end of the spring to meet a Fiscal Year deadline) and this urgency was the match that lit the fuse. The grant covered water, treats, chalk, games and more. More broadly, that community development mandate that helped us sort our priorities. The event had passionate backers who were willing to do the necessary work to actually make it happen. While Tom Tom provided the necessary event infrastructure—permitting, equipment, music, a beer sponsor and an army of volunteers—the neighborhood itself made it a celebration. The association also brought legitimacy, which was a big deal and the next post will talk about the mechanics of actively building that. It also has a potent communication network and its own crew of activists, several of whom played essential roles. The organizing group, which met in restaurants, street corners, living rooms and informal settings had interesting ideas from a variety of directions—and none were mutually exclusive. Tomas’ urban farming exposition, for example, would have anchored a fun party all by itself. Brian’s street painting allowed people to literally etch their aspirations into the neighborhood fabric—and provide a visible core for the celebration. Lena and Greg brought a fire truck(! ), a bus, and a host of community groups. My photo booth allowed people to say “I’m here” in a way that was more profound than I could expect. And on and on—and they were all people who have both ideas and accomplishments. No on in the room offered anything that they couldn’t deliver. The City has had some notable successes with community block parties. They’re popular and serve a useful purpose for outreach and as ways of collecting community feedback. So the relevant City institutions were receptive—although this would not be the linear path we had expected. If I had to pick one subtle but crucial partner, it would be the nearby Hinton Avenue United Methodist Church. Their endorsement tipped the scale and they provided extraordinary positive energy for a celebration on Palm Sunday. When we learned that their bluegrass gospel band—led by a ninety-year-old fiddle player—would start the party, we knew that this would be something truly special. This incarnation of the Belmont Bash met a real need, but there was more to it than that. There were also multiple champions with similar (but not identical) agendas who were ready to make it happen and a little (but not a lot) of cash available. I argue all the time that Monticello Road possesses traits that are typically American, but it’s special because it has unusually many strong threads that overlap. The same was the case for the Belmont Bash. It was always clear that it would succeed because it had extremely positive energy coming from several directions—largely (but not always) in resonance. The next post will describe the process and challenges of organizing the bash and what that reveals about the community. Organizing Committee: Paul Beyer, Melissa Easter, Adam Frazier, Deb Jackson, Greg Jackson, Peter Krebs, Robert Lewis, Pete O'Shea, Tomas Rahal, Lena Seville, Matthew Slaats, Julia Williams, Brian Wimer, Carolyn Zelkow and many community organizations.